Adam Weinstein surveys the green algal blooms by the dock behind his house Friday. He said it looks much thicker after Tropical Storm Gordon passed through last weekend. The Florida Dept. of Environmental Protection keeps track of where algal blooms have been spotted in each county. Here's where algae has been sampled recently in Broward County. "I took my five-year old son to go kayacking off of Annie Beck Park... and you could see a little tiny bit in the water,” he said. "I was like, 'maybe I'm nuts because we haven't had that in Broward yet.'" But sure enough it was, and he reported it to the state's Department of Environmental Protection. Hear more about what the algae outbreak means for Fort Lauderdale's waterways. Governor Rick Scott declared a state of emergency due to the algae in seven counties in July 2018, which included Palm Beach County, but not Broward. "Earlier this week, I noticed it starting to get a lot thicker," Weinstein said. "It doens't stink too much here yet, but it collects at low tide and high tide points...on the top it looks like a bit of an oil slick, but it's particulate." The algae outbreak in freshwater is caused by discharges of excess water from Lake Okeechobee. It’s known to carry harmful bacterias, and can cause respiratory and other health problems in humans. The blooms feed on nitrogen, often found in lawn fertilizers and pet waste. They take oxygen from water, killing marine life, including fish. Weinstein is frustrated with the state's response to the red tide, on the West Coast of the state, which is also caused by a type of algae, and he worries that not enough will be done to address the blue-green algae in his own backyard. "I've seen fewer live iguanas, and more floating dead ones," he said. "We're life-long Floridians, this land matters to us, and we knew that a lot of this is fertilizer and agricultiral by-product. We're all going to have to do a little bit to maybe change things so that this isn't a bigger problem going forward." The state’s Department of Health has not yet issued any health advisories for the Fort Lauderdale area, according to city spokesman Chaz Adams. Adam Weinstein first noticed this bloom of blue-green algae while kayaking in Annie Beck Park two weeks ago. He said, Tropical Storm Gordon looks like it brought even more blooms to the area. Adams acknowledged that the city has also reported the algae sightings to the state’s Department of Environmental Protection. 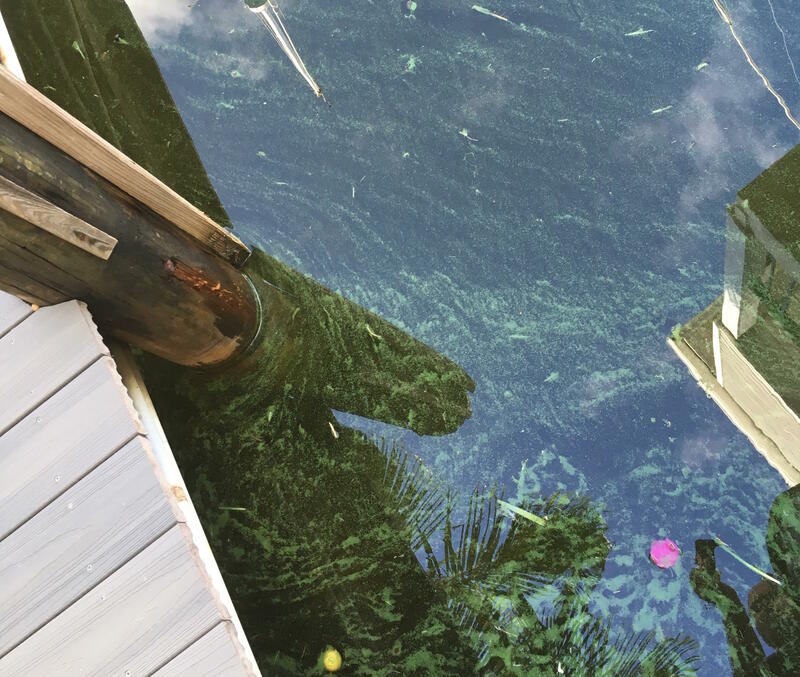 Dee Ann Miller, a spokesperson for the state's Department of Environmental Protection, said the department sent its Bloom Response Team to sample the algae blooms, near Las Olas Boulevard, earlier in the week. "We will continue to respond as quickly and efficiently as possible to both observed and reported algal blooms. Persistent blooms are routinely monitored and retested,” Miller wrote in an email to WLRN. Report algal blooms directly to [Florida’s Department of Environmental Protection] by calling 855- 305-3903. Reports also may be submitted online. Do not fertilize your lawn near the waterways. Fertilizers used in landscaping contain high amounts of nitrogen and phosphorous. Rainwater washes those into the water and feeds the algal bloom. Pick up after your pets. Pet waste has high concentrations of nitrogen. Pet waste left on the street or lawn is washed away into the storm drains. All drains lead to the waterways like canals, rivers, bays and beaches. Do not dispose of pet waste in the waterways. Do not swim near algal blooms. Do not allow pets to drink the untreated water when algae is present.